Dr Tom Lewis and Peter Ingman; Avonmore Books; hardback; 234mm x 152mm; 368 pages; many black and white photos; 10 colour maps; 21 colour aircraft profiles; 19 colour ship profiles. When the Pacific war began it was a case of “when not if” Darwin would be attacked. But nobody could have predicted the extraordinary scale and ferocity of the 19 February 1942 raid. A massive strike force, blooded at Pearl Harbor just weeks before, hit Darwin in the biggest Japanese air attack ever in the South Pacific. Since then, generations of Australians have been drawn to the stories and folklore of the Darwin action. But facts have blurred and mythology has thrived. What of the warning that never happened? What of the ghost ship actually sunk in the Atlantic a year earlier? Did a fighter pilot contrive a false combat record? Did the authorities cover up the raid? Why do Australians know so little about it? 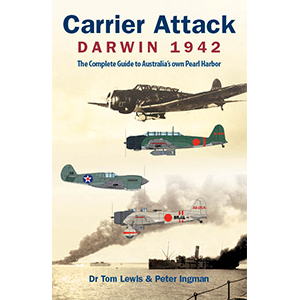 This is the book that tests these many Darwin myths and reveals new information: another ship sunk; the actual intent and nature of the attack; the precise extent of the Japanese losses. The Darwin raid is usually portrayed as a wholesale disaster for the Allies, and a day full of military ineptitude. Carrier Attack shows the defenders were alert and fought with purpose. Arguably it was the Japanese that wasted much of their attacking strength, and in this way the Darwin defenders avoided a much larger catastrophe. Carrier Attack provides a timely and fresh analysis of the raid. Most importantly, it draws on specially translated Japanese sources.